Convertful gives you a complete solution to easily convert the visitors into leads. It lets you create subscription forms in minutes using a compatible drag and drop builder. It doesn’t require single lines of code. Convertful is a tool to engage and convert site visitors into subscribers using behavior-based opt-in forms. This plugin is an ideal solution for bloggers, e-commerce sites, businesses, marketing, agencies, professionals, and sales that let to grow your business without taking much effort. It is a great tool for all type of marketers. This plugin works effectively in all major e-commerce platforms and email marketing software. Converful is composed of 50 amazing signup form templates that are optimized to work conveniently for mobile displays. It includes features such as A/B split testing functionality, drag, and drop form creator, exit intent triggers, all modern sign up form types, leads recovery, behavioral targeting etc. Note: Convertful provide 14 Days Money Back Guarantee, if you are not satisfied with this product. These simplified features help users to engage and convert site visitors. With this plugin, you will be able to customize styles, layout, elements, colors, sizes, shapes, fonts, etc. 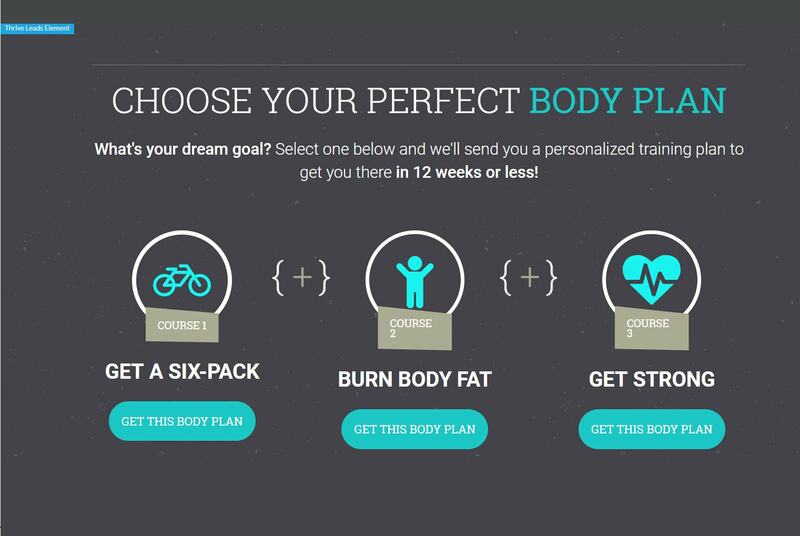 This plugin lets you create any form as you ever wish. Convertful provides visitors the best user experience with gentle display triggers. It gives an automatic relevant lead magnet for all the future posts in a category. Convertful gives you a chance to appreciate exact focusing by giving you a chance to set the definitions and tenets of your structures, similar to when they show up and to whom they ought to show up to. Annoying-free forms with full control of triggers and conditions defining if the form should appear. Advanced targeting conditions including time on site, page URL and URL get parameter, session start/end URL, date, interaction with other forms, referrer, number of visits, specific cookies, browsing device, screen width, and more. This plugin helps you to see whether the lead data reached the email list or not. If the data doesn’t reach, then it informs you and stores your new leads to re-submit automatically once the issues are solved. Customizable layouts, fields, positioning, etc. Powerful display rules and targeting functionality. Tracking pixels for conversion events. Send data to multiple marketing software. Communication notifications and much more. Move to WordPress Plugins>Add new, in the search bar type in ‘Converful’. Now install and activate the plugin, this plugin contains the name Converful MailChimp forms. Once you activate this plugin, you will find a button ‘Connect to Converful’. Click on the button. Once you connect, you have created an account. Here you will find an account creation window. After filling the details, click ‘Create an account and Connect’ button. That’s it, the account is connected to your WordPress website. Now you can start using it, by pressing the ‘Create New Optin’ button. Once the plugin is activated, you will find a connection window, in that window click ‘Connect to Converful’ button. Now this plugin will automatically recognize your account, and to connect, it just insists you press the ‘Approve’ button. That’s it, your account is connected, and you can start using this plugin by just clicking ‘Create New Optin’ button. Note: The above steps can be used if you are a WordPress user. For other website users, you can just add the converful HTML tag and start working with the widgets of converful. You need not to install the converful plugin when you add the <HTML> code. Callout screen allows you to get a preliminary consent of the visitor with the offered value, by replacing form fields and submit button with ‘Yes’ and ‘No’ buttons. This option allows you to show your gratitude to the visitor for subscribing. You can also use it to provide offered value, which should be available after subscription, such as coupon codes, links to related articles or webinars, etc. Using own CSS→ if you are using CSS styling, then you have to add ‘!important’ rule. Names of post variables(This is optional). Based on the shortcode( This can be done only through plugins). After the post content(This can also be done only through plugins). These are the main options to play with the widgets. Once done you can move to your WordPress website to see the changes. Converful is able to solve issues like losing subscribers, forms spamming, and non-responsive/ non-mobile friendly forms. Many of the e-marketers are not aware of losing their subscribers. Form creation software simply ignores the API issues and those, who subscribed during the issue period, will never reach the contact list. But converful plugin helps the subscriber to see if the lead data has reached the list. If not, this plugin stores the data during the issue period and sends you a notification about the issue and then it automatically sends them back to the list once the connection to the list is restored. There is an annoying issue that the same offer appears in different popups on your website, inside boxes, bars, etc. That popup on top of each other. That forms will be displayed on all the pages, and that keeps appearing for visitors who have already closed the form. This spam is annoying for visitors. But converful tool will help you in these cases to target the forms based on URL, behavior, and interaction with these forms. With this, you can create the relevant offers that only the right people see at the right time and place. For many different services, the mobile version of the forms is a complete mess. It badly affects the layout, styling and covers the most part of the mobile screen. Google expects that any website should be mobile friendly and depends on that they provide you the ranking score. If the website is not responsive, then it might lead to poor ranking. In order to overcome that, convertful has a responsive design for the forms, hiding excess data that overlays too much content on mobile screens. Thus, each Convertful form template has mobile version meeting requirements of the Google Mobile-Friendly Rules. Convertful offers the accompanying venture evaluating plans for clients to browse. Give the points of interest a look, and select the best arrangement for your business. Right now our flexible builder allows translating most of the widgets’ parts. And when we implement the full localization, you’ll be able to translate even small details like error messages and so. Two new fields types that you can use for your forms. Additional options for adding new subscribers to the popular ESPs. Additional automation like “add a tag to the contact” and so. Ability to create single-question survey widgets (without asking for email). Ability to add unlimited screens to your widgets and build more complex logic for them. 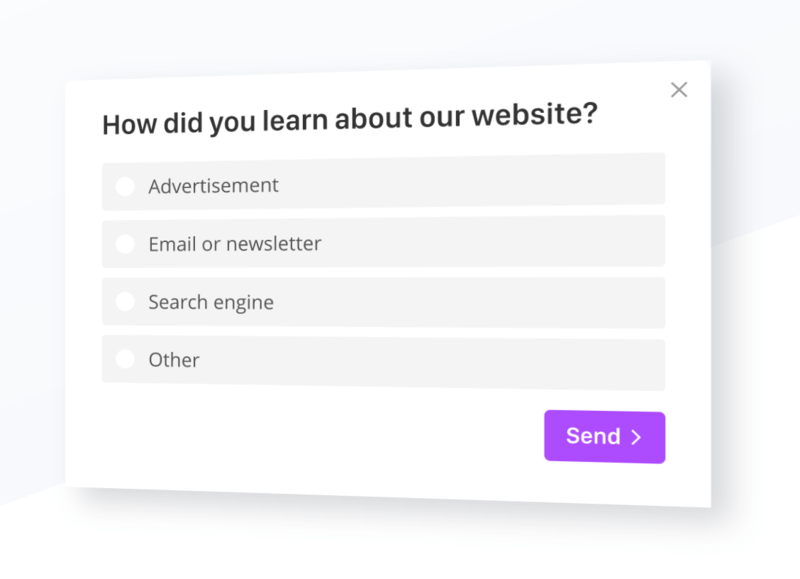 For example, you can offer different lead magnets based on the survey from the intro screen. Ability to target widgets based on visitors’ parameters in the connected ESPs. Ability to use Intercom as data-destination for the submitted forms. This will allow qualifying Intercom leads based on the Convertful data. The ability to connect Zapier as another data destination for the submitted forms. Ability to share widgets for other team members. Please note: this will be available as a separate plan option. We’ll send weekly reports about the widgets’ performance. Ability to use own domain and branding. (Only for the holders of Whitelabel Agency plans). Ability to use “Spin-the-wheel” and, probably, some other gamified widgets behaviors. Survey Widgets and Gamification Widgets will provide you with completely NEW outstanding tools and strategies. Team Invites / Shared Widgets / Sub-Accounts and Whitelabel Dashboard features that are essential for Digital Agencies. Convertful evolved greatly since the previous templates were created. Now we can offer much greater flexibility and cover more use cases. You’ll be able to download reports about widgets’ performance as a single file. We’ll split this into smaller feature requests. When you make a decision and decide to buy this tool, it is not only enough to check out the reviews from the experts, but it is also important to see if the common people who are using it are really satisfied with this product. In order to find out, we have created a behavior-based Customer Satisfaction Algorithm™ that gathers customer reviews, comments and Convertful reviews across a wide range of social media sites. This helps to gather information about the positives and negatives of this tool. With all this information, you can decide whether to buy this tool or not. Hope you liked this convertful tool review. If you have any queries please feel free to comment on us. You can subscribe to us on Facebook and Twitter. 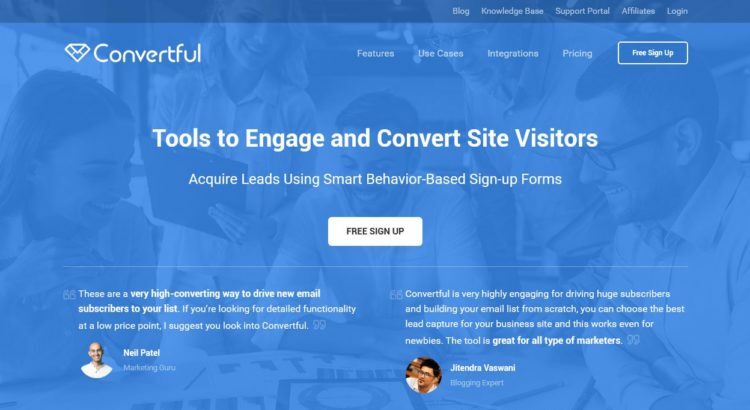 Convertful converts visitors into subscribers using behavior-based opt-in forms, it helps in acquiring more leads for your website without coding knowledge. 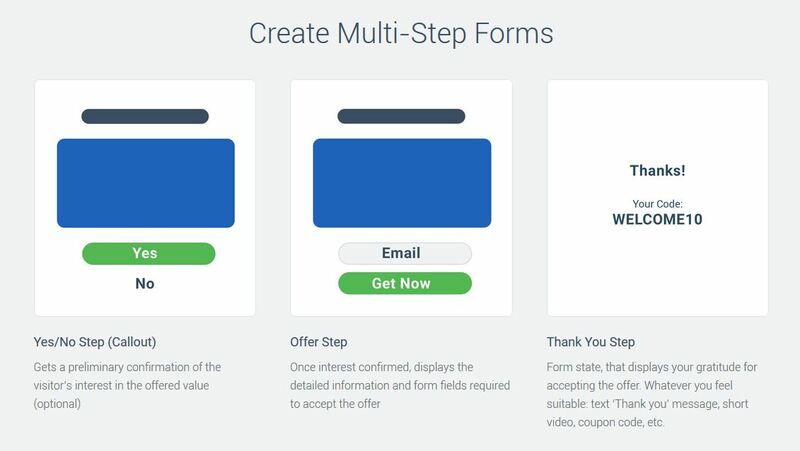 Convertful provides multiple sign-up form types to gather leads. It has lots of integrations with popular email service providers. 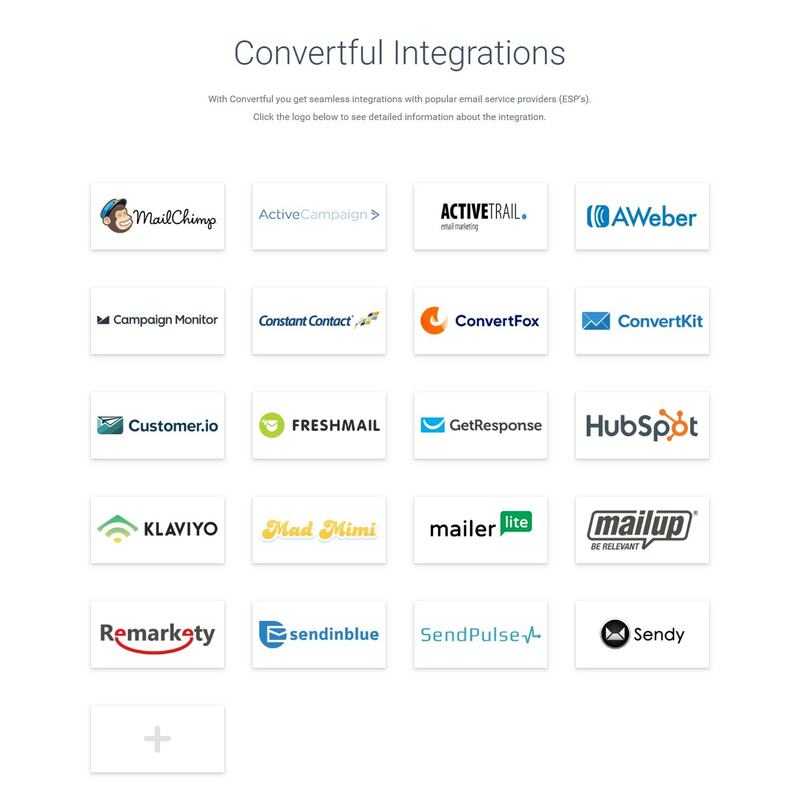 Convertful supports all CMS and multiple eCommerce platforms. It has 50+ Beautiful responsive Templates so you can work with it a lot.